Some people are just born to be writers. Truman Capote was born in New Orleans to a salesman and a 16-year-old beauty pageant queen. He could read when he was five, and would often carry a dictionary and notepad with him. According to Capote, however, he did not start "writing seriously" until he was 11. Capote was raised in Alabama, and was a lonely child, often ostracized. He took comfort in words and would write every day after school. He befriended his neighbour, the award-winning author Harper Lee, who was a year older than he was. She later based the character of Dill in her only novel To Kill a Mockingbird on Capote. The pair remained fast lifelong friends until Capote′s death. 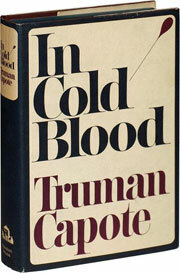 Capote moved to New York when he was seven. He wrote steadily throughout his childhood and adolescence, practicing for hours a day after school. When he was 17, he decided he was finished with formal education, and landed a job at the New Yorker. Far from glamorous, the position consisted of sorting, filing and clipping cartoons, but it nevertheless put Capote on the right path for a budding writer. 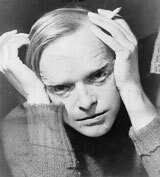 After numerous of his short stories were published in literary journals and magazines, Capote′s first novel, the semi-autobiographical Other Voices, Other Rooms, was published in 1948, and enjoyed nine weeks on the New York Times bestseller list. Dealing with issues of homosexuality, the book was controversial and had as many detractors as admirers. In its pages, the main character Joel comes to terms with his homosexuality, and at long last feels the tremendous relief of being truly oneself. Capote himself was openly gay, at a time when that was much less common. However, the literary and arts community of New York City was certainly the place to do it, and Capote enjoyed at last a glamorous lifestyle, forging friendships with famous eccentric artsy types like Andy Warhol. Capote was well-known and (mostly) well-liked for his wit, humour and love of a party. In 1966 he threw a famous masquerade evening called the Black and White Ball at the Plaza Hotel, which was considered the social event of the season, and attended by the likes of Frank Sinatra. The evening was such a lavish occasion that there′s an entire book written about it: Party of the Century by Deborah Davis. Capote suffered from both boredom and depression, and abused drugs and alcohol terribly to combat both for many years, and was in and out of rehabilitation throughout the 1970s. He died of liver disease in 1984 at age 59. Enjoy Capote? Discover other collectible authors like Robert Louis Stevenson.